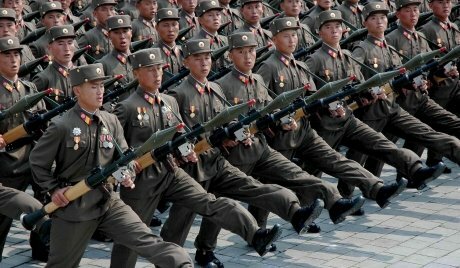 North Korea is holding large-scale military drills amid heightened tensions on the peninsula, South Korea says. The move comes after the North Korea threatened to scrap the 60-year truce which ended the Korean War. Later on Thursday, the UN Security Council will vote on a resolution imposing tighter sanctions on Pyongyang following its recent nuclear test. Patrick Low, a spokesman for the Australian foreign ministry, said there was still “some merit” in having a North Korean embassy in Australia, including enabling more direct communication on human rights issues. But said the plans had been frozen “until further notice” while Australia worked with the UN Security Council on its response to North Korea’s nuclear test. The nuclear test, North Korea’s third, followed its apparently successful launch in December of a three-stage rocket – a move condemned by the UN as a banned test of missile technology. Pyongyang claims its nuclear test involved a smaller and more powerful device – prompting concerns it could be moving closer to creating a warhead small enough to arm a missile. A spokesman for the South Korean Defence Ministry, Kim Min-seok, said Pyongyang was “currently conducting various drills involving the army, navy and air force,” and that further exercises were being prepared, the Yonhap news agency reports. “Given that this training can [be] extended into a provocation at any time, we are taking great interest in these activities, and are strengthening our own preparedness as well,” he said. South Korea has previously warned it will respond to any provocation from its northern neighbor, with whom it remains technically at war after the Korean War ended in 1953 with an armistice, not a formal peace treaty. On Tuesday, North Korea’s military command said it would end that armistice on March 11 because of the threat of sanctions and the joint South Korea-US military drills, which take place annually but which Pyongyang sees as war preparation. The UN Security Council, meanwhile, will vote on the sanctions resolutions on North Korea at 10:00 EST. The resolution, which is expected to pass, was proposed by China and the US, and will target North Korea’s diplomats, cash transfers and access to luxury goods. It will also impose asset freezes and travel bans on three individuals and two corporations linked to North Korea’s military. The sanctions have been described by Washington’s UN ambassador Susan Rice as “some of the toughest sanctions” the UN had ever imposed.